Gastric carcinoma is more frequent in the Orient, South America, eastern Europe, and countries of the former Soviet Union than it is in North America and western Europe. Its incidence has been declining throughout the world for the past 50 years. 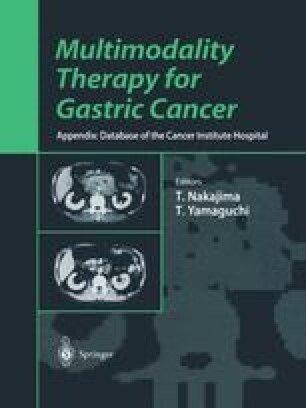 Screening for gastric carcinoma is performed only in Japan and then on a limited basis. Therefore, in rest of the world patients are frequently diagnosed with advanced gastric carcinoma at the outset. It had been estimated that, more than 22600 new cases of gastric cancer would be diagursed in 1998 in the United States, and 13700 deaths were expected . In Western patients the curative resection rate (R0 type surgery) can be achieved in fewer than 50% of patients [2,3]. Clearly, this low R0 resection rate in the West is due to suboptimal clinical staging and the higher stage at diagnosis. In Western countries the incidence of proximal gastric carcinoma has risen during the past 15 years, and proximal gastric carcinomas carry a worse prognosis than do distal carcinomas [4,5]. This work has been supported in part by the Capporella Family Fund.